Find a Long Island Haunt and Ghost Tour expedition. Throughout the Winter and early Spring months, many seals make their home on the shores of Long Island - something that even some locals are not aware of! For those who would like to get a bit more up close and person with these gorgeous marine mammals outside of the aquarium, there's a great option - why not go out on a Seal Watching Excursion? If you'd like to get a better look at Long Island's seals, then you're in luck! There are guided walking tours and seal watching boat excursions offered locally, and the seasoned pros guiding your adventure know just when and where to find seals sunbathing and swimming along the shoreline. Seals typically take up residence here on Long Island in late Fall, and they typically hang around until late April or early May. A guided seal watching tour gives you the opportunity to view these beautiful creatures in their natural habitat without disturbing or disrupting them - professional tour guides know the right way to maintain a proper distance, while still giving you a great view of the seals. Another benefit to going out on a Seal Watching Excursion is that your tour guide can give you some insight about the local seal population, as well as the other wildlife that you man encounter along your journey. It is not uncommon to come across other unique local wildlife along the shores of Long Island both on land and at sea. The professional tour guides that lead Seal Watching Excursions are well informed about our local marine life, and can take you on a trip you won't soon forget. This year, why not get more up close and personal with Long Island's wildlife? 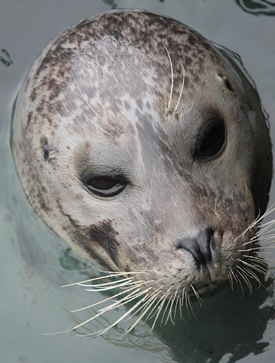 Plan a Seal Watching Excursion today! More Info about Seal Watching on Long Island. Fill out this form to have one or ouf representatives contact you about a Seal Tour.